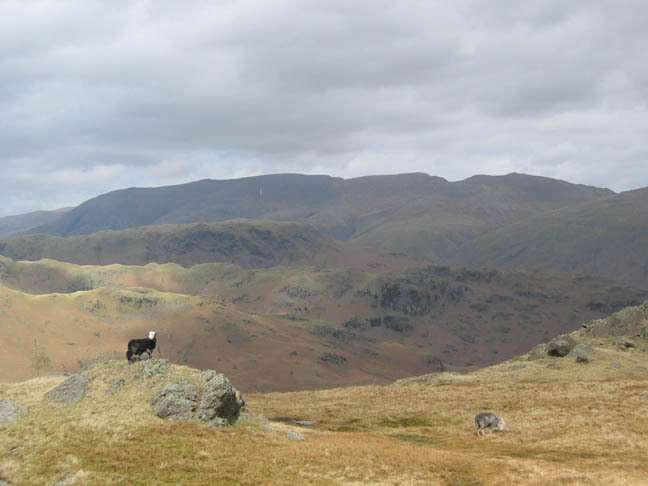 " Easedale Fells and Sergeant Man "
Date & Time: 27th April April 2006. 12.00 noon start. 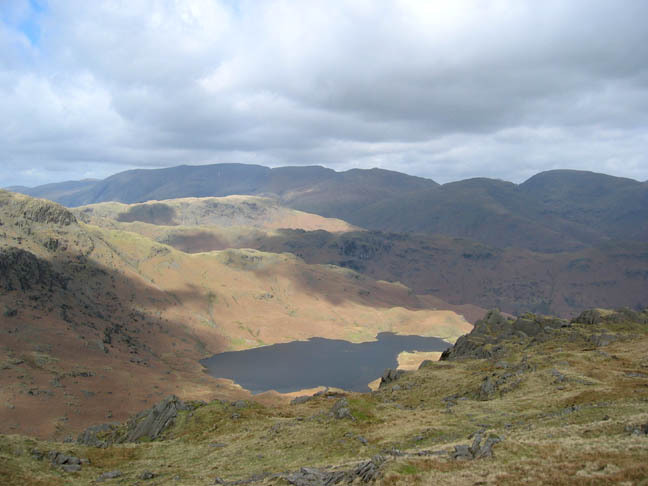 Places visited : Grasmere Village, Silver How, Blea Rigg, Sergeant Man, Tarn Crag, Easedale Tarn, and back. 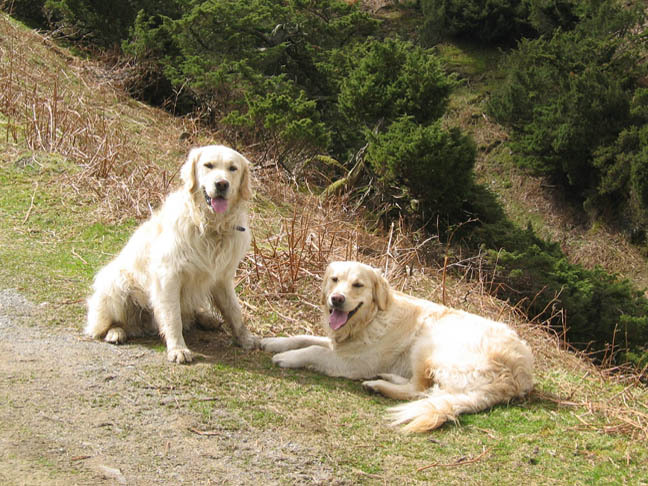 Walk details : 8.65 mls, 2,690 ft of ascent , 7 hrs 7 mins including a long lunch and a brief tea stop. 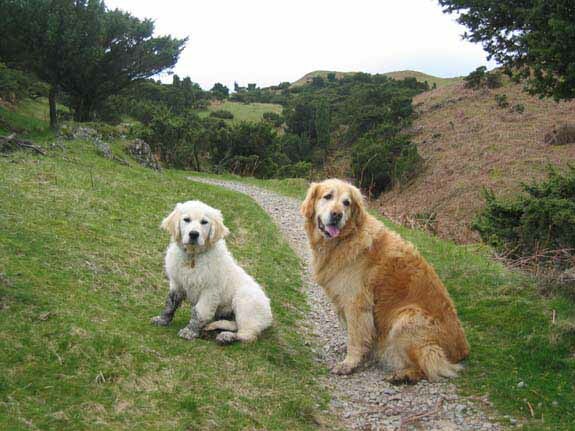 Walked with : Ann and the dogs. Weather : Sunshine and a cool breeze at times. High cloud giving nice light and shade effects. 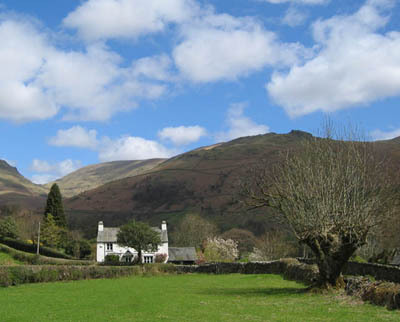 Start location at Grasmere, with a walk in from the main road through the village. As the television programme says, men of a certain age become extremely grumpy when faced with the trials of modern life. Today was a superb example of a "grumpy old man" start to a walk. We drove into, around, and back out of the village having noted the price to park for more than four hours varied between £5.50 and £7.50p. Everywhere else was painted with yellow lines so we retreated to a more distant starting location. 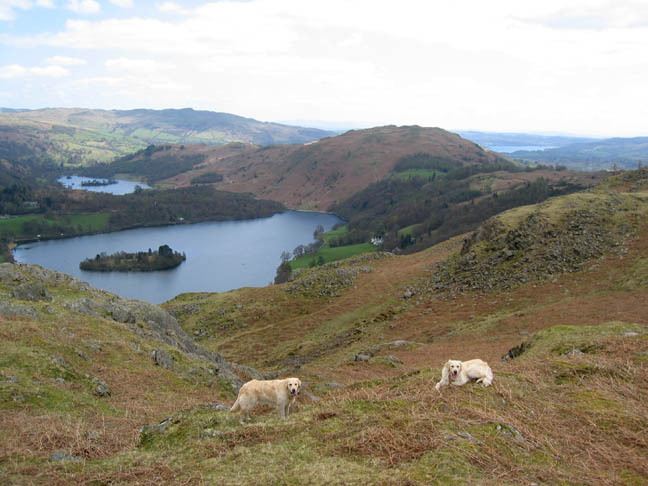 Grasmere is a victim of it's own success, but prices like that are hardly likely to encourage visitors are they ? Still the weather was superb and the countryside soon dispelled any grumpy thoughts. 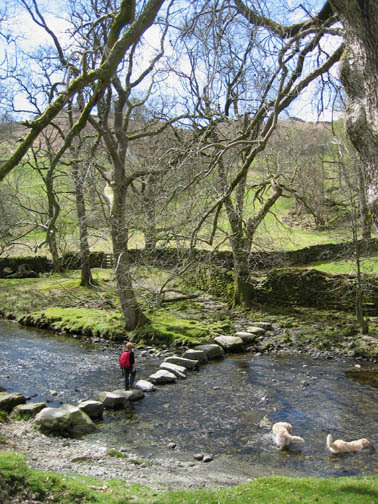 A short-ish walk though the village brought us to the stepping stones near Goody Bridge and once we were over them, it was fells all the way. 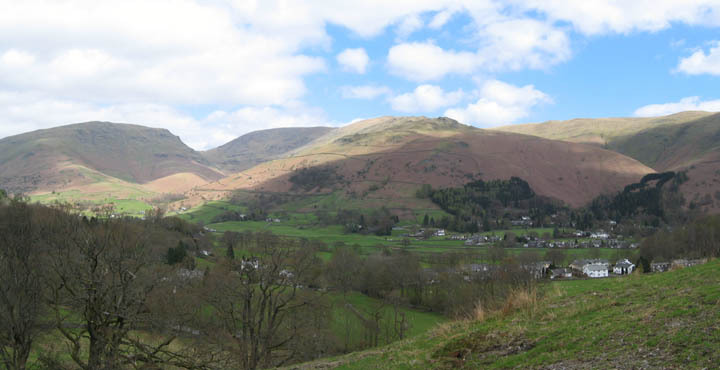 Climbing out of the village, our view across to Seat Sandal and Stone Arthur improved with every step. Above the intake wall now and onto the final pull up to Silver How. 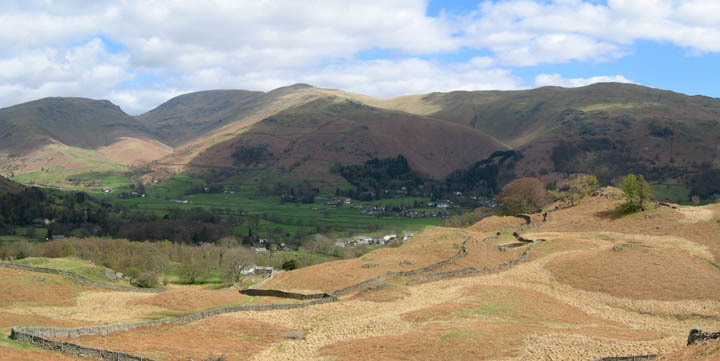 Below was the unusual double stone wall towards the higher ground above Kelbarrow. as we climb through the Juniper covered section of the walk. Harry ( with Holly ) two years ago at the same point. 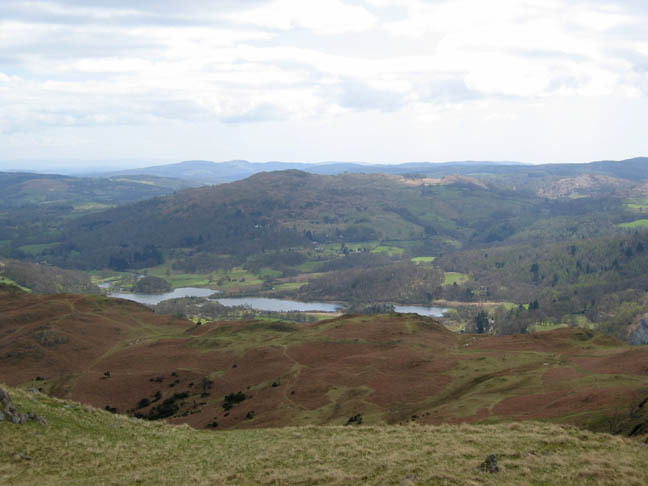 with the lakes of Rydal Water in front and Windermere behind Loughrigg Fell. 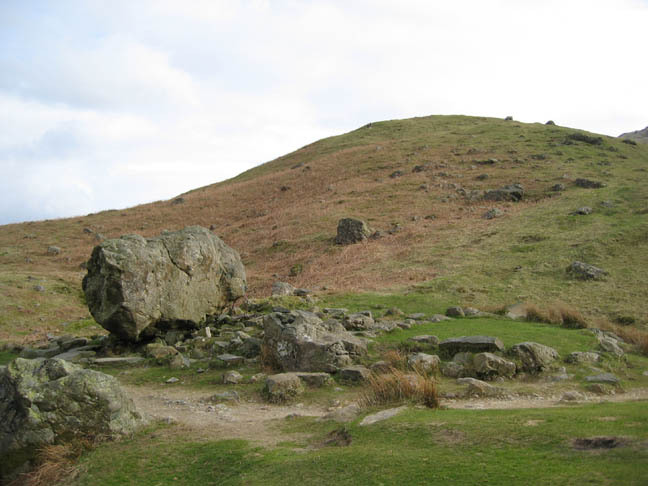 Silver How Summit, with it's delicately balanced stone cairn. With the fine weather at present, the stones stand a chance of staying in place for quite some time. 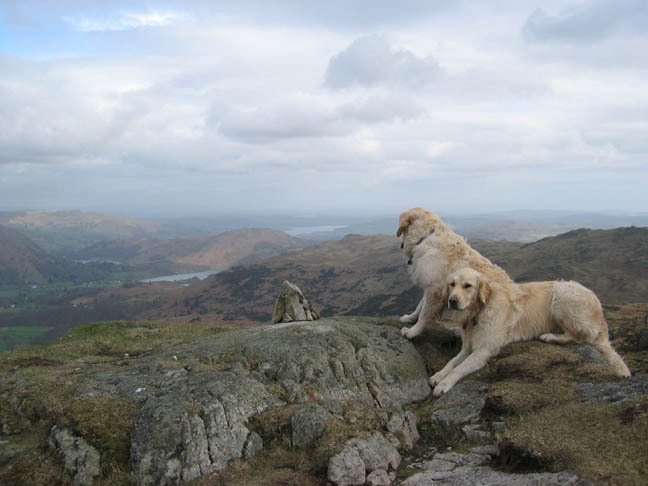 This summit is a first visit here for Bethan, but was the first Wainwright Harry climbed almost 2 years ago to the day. 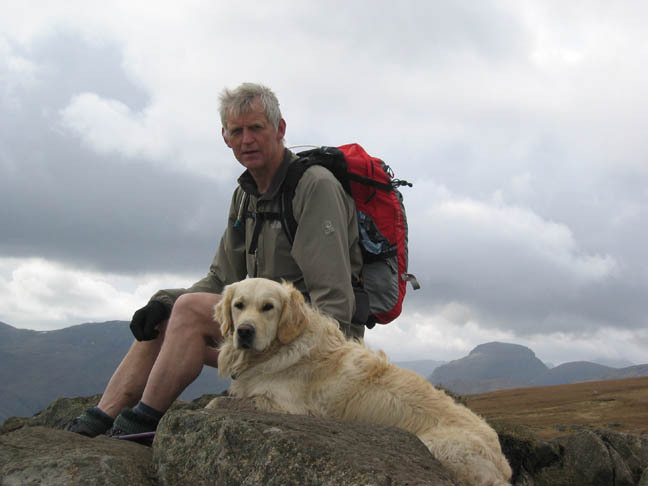 In the intervening year and 364 days he has managed to add 133 more Wainwright summits to his list of achievements and is on target to complete them all by the year's end. A classic panorama starts to unfold as we look round on Silver How. 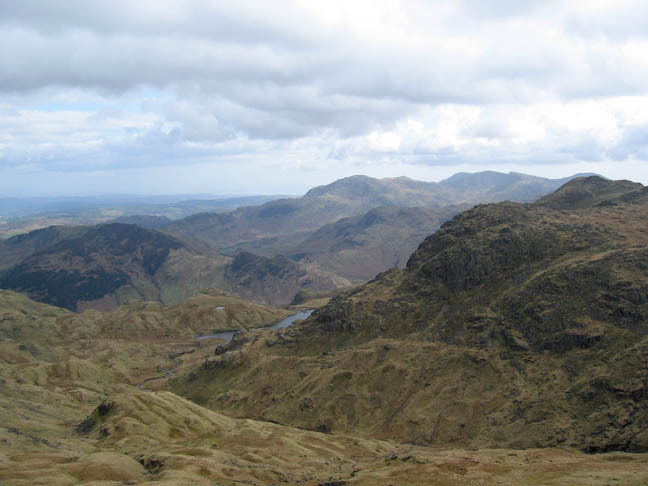 Pike o' Blisco, Crinkle Crags, Bowfell and the Langdale pikes. Click here or on the photo for a larger panorama. Once Silver How is reached, the path meanders onward through various larger and smaller rocky outcrops and visits several smaller tarns. This is Lang How, beautifully reflected in its adjacent tarn. A moment later the dogs found it . . .
and the reflections were lost ! The unusual reed covered larger tarn also at Lang How, with the Langdale fells behind. but by that time I think Ordnance survey will be a thing of the long and distant past too. As we pass Little and Great Castle Hows the terrain gets slightly more rugged and our next target Blea Rigg comes into view. Sergeant Man in the background is getting progressively closer. 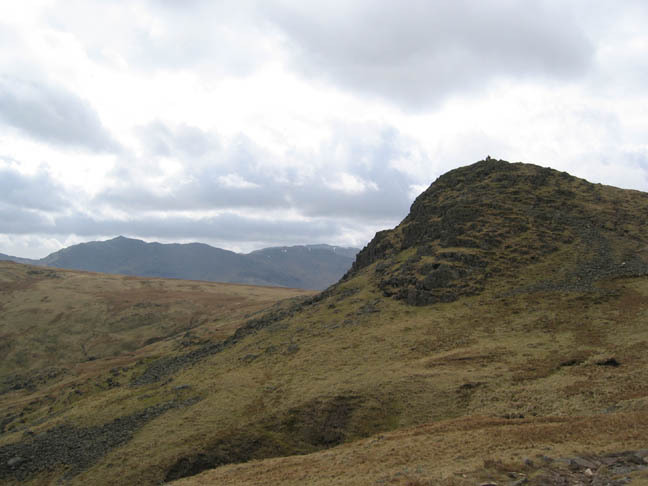 The shelter below Blea Rigg Summit that Wainwright notes in his book is still there and is still accessible. 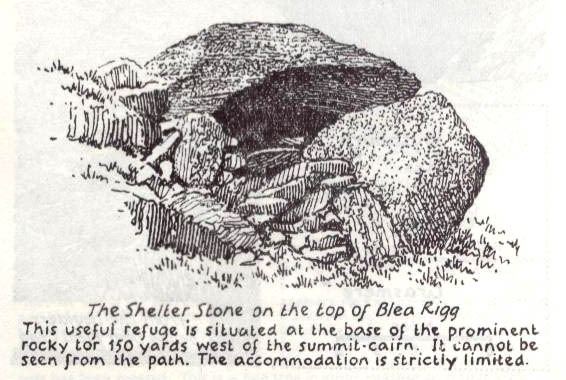 Compared to his drawing there are a few extra stones but the inside, which he describes as 'strictly limited', is rather less inviting due to being used by the local sheep population rather more times than would be desirable for a pleasant stay. 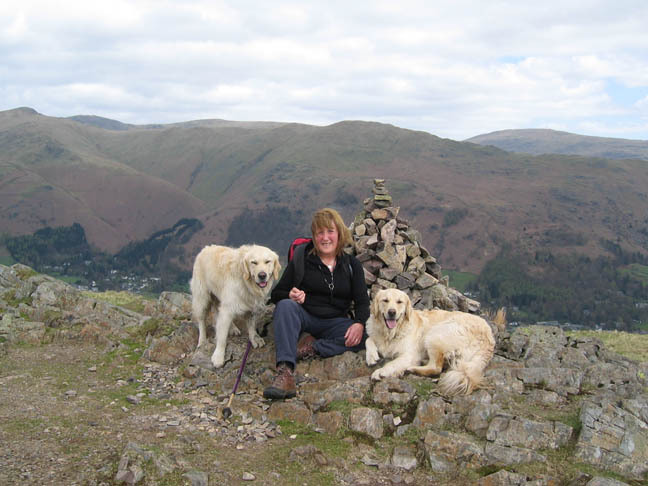 provide a backdrop to Ann and the dogs on Blea Rigg's summit rock. entertain us as we look for a suitable lunch spot. 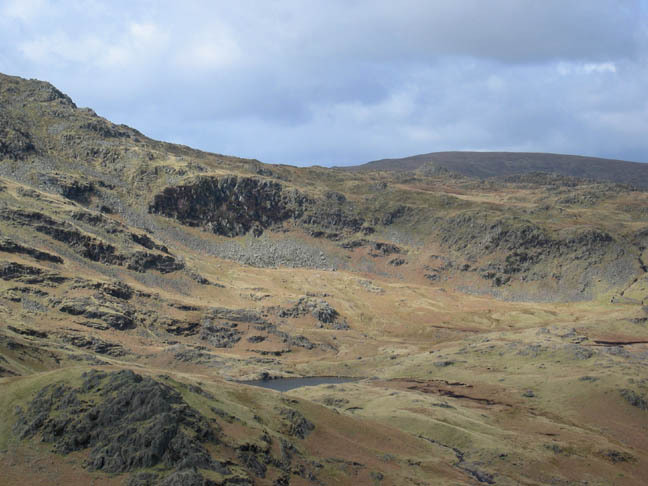 Easedale Tarn beyond the cliff edge of Blea Crags. 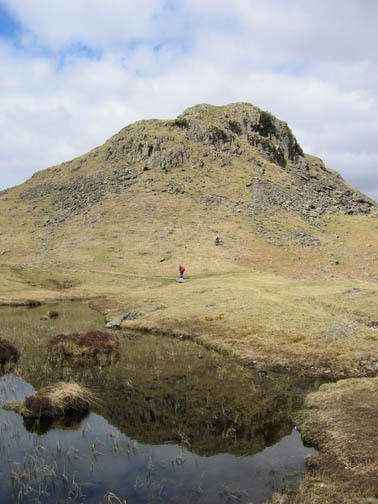 Tarn Crag in the sunshine opposite will form part of our return route. 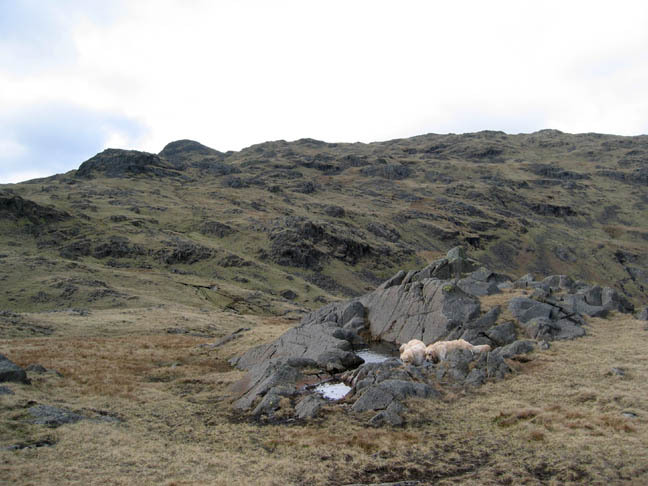 Codale's beck feeds down into Easedale Tarn and onward to Grasmere itself. Climbing towards Sergeant Man we suddenly view another stretch of water. 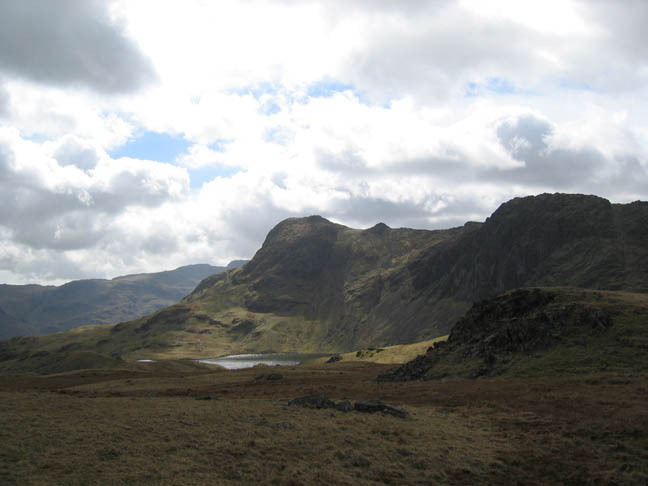 This time it is Stickle Tarn, nestled closely under Harrison Stickle and Pavey Ark, two of the Langdale Pikes. 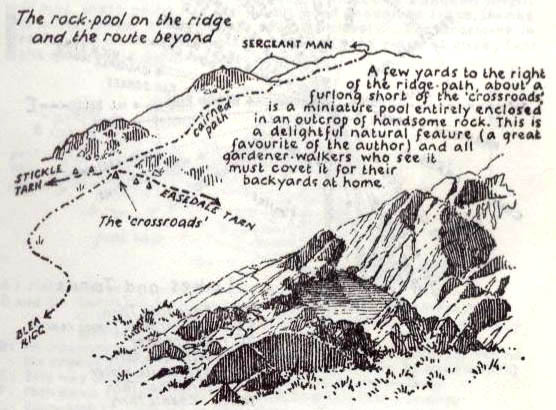 Fifty years ago Wainwright wrote of a delightful rock pool, the envy of any keen gardener-walker, and a personal delight of his. It's whereabouts were a little unknown but suddenly there it was - just a furlong short of the crossroads. Almost there - Sergeant Man viewed from our eastern approach. 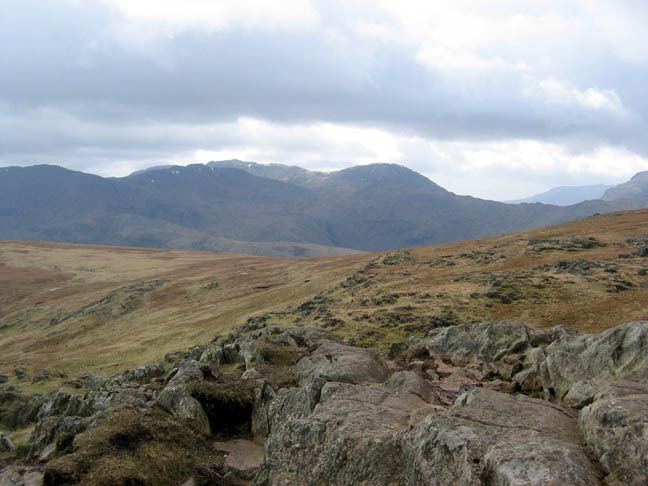 The rocky outcrop is poised on the lower slopes of High Raise and is a magnificent viewpoint for the fells around. 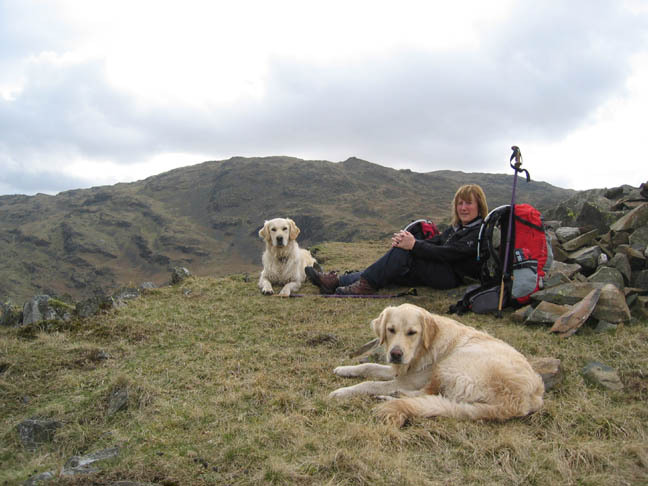 The author and faithful hound on the summit. The sunshine had allowed me to convert my trousers to shorts, but it seems a slightly cool breeze had temporarily given me rather cold hands ! and south across to the Coniston Fells. More westerly now . 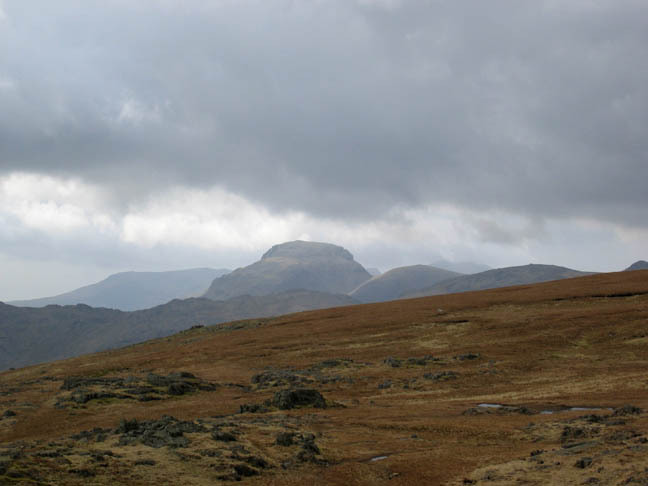 . .
Bowfell, Esk Pike and Great End, with the Scafells behind. Great Gable, standing tall . . .
with the Western Fells disappearing into the distant haze behind. Turning the corner now, we made tracks east and headed for Tarn Crag. 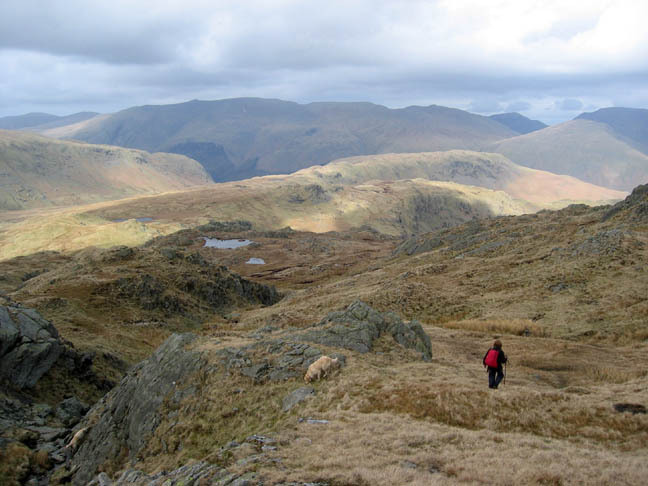 Ahead and to our left is Calf Crag and Steel Fell, with the Helvellyn Range behind. 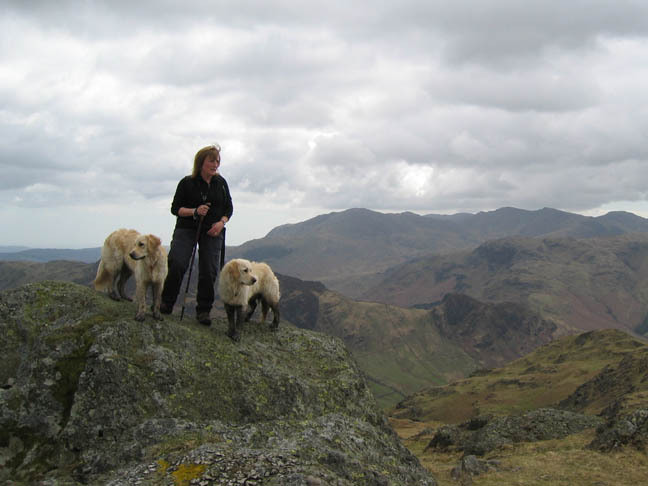 Ann on Tarn Crag in the foreground, with Blea Rigg and it's adjacent fells in the distance. 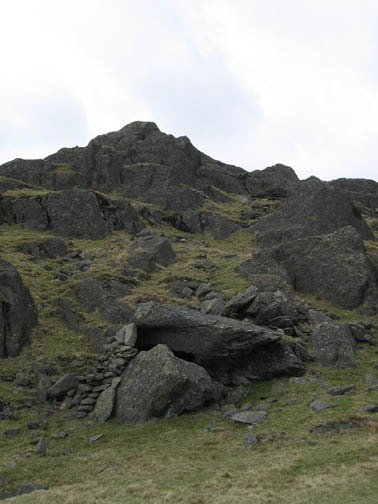 The impressive summit cairn on Tarn Crag. Don't bark Bethan or you'll blow it over. 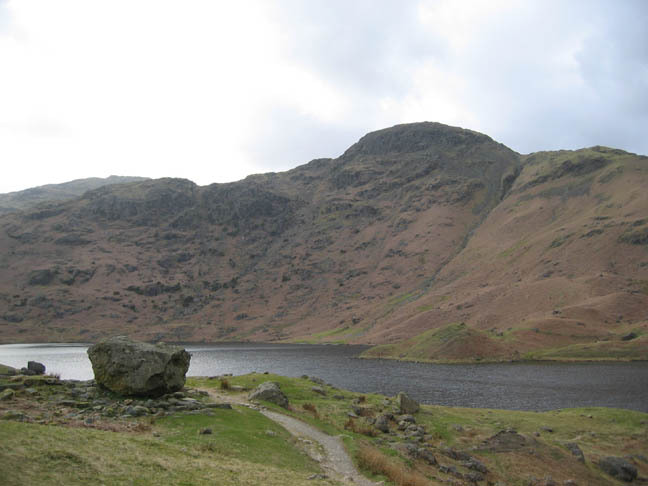 with Easedale Tarn and the 'Tearoom Rock' in the foreground. Fifty years ago there was still the remains of an old stone hut where refreshments were served in Victorian Days. Today the area still holds the ghost of the hut, with signs of old wall foundations and the flat grass area in front. Hold the cursor over the picture to help the imagination - Anyone for tea? 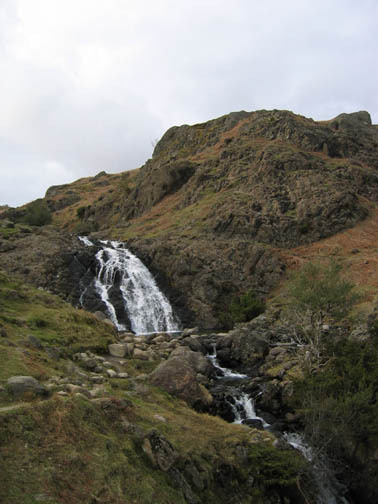 The outflow from Easedale tumbles in a series of wonderful falls and cascades as it makes its way down towards Grasmere. This is one of many Sour Milk Gills in Cumbria. 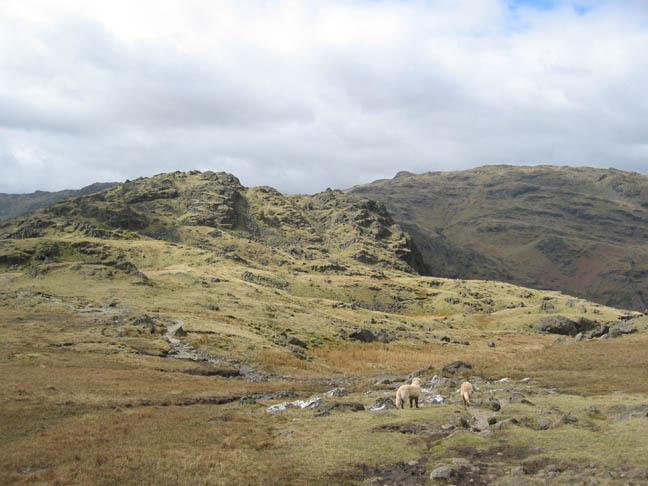 This is the Easedale one, then there is the one beside Base Brown in Borrowdale, and another descending from Bleaberry Tarn under Red Pike in Buttermere. and each is impressive in its own different way. 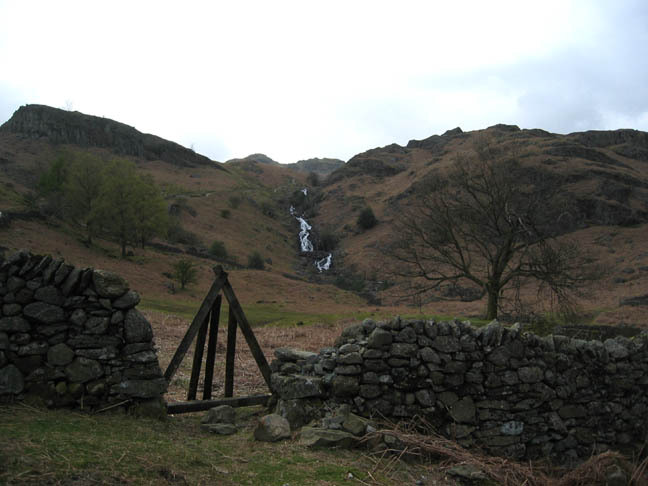 The lower section of the final falls before Sour Milk Gill enters the more gentle farmland in the flat part of the valley. The waterfall in the previous photo forms just the very top part of this series of cascades. 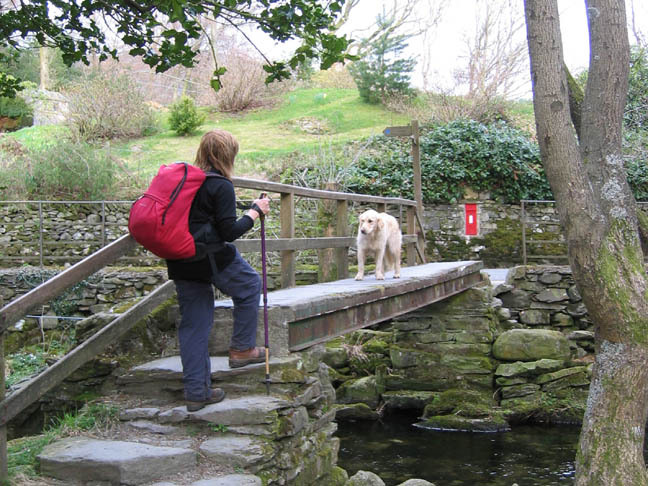 and a steel reinforced old bridge over Easedale Beck a few hundred yards upstream of the stepping stones we used on the way out.